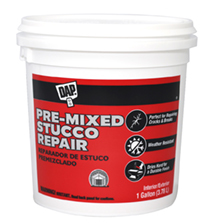 An easy-to-use patching compound for repairing minor cracks and breaks in stucco. It creates a hard durable patch which when painted, blends evenly with the original stucco. Textured finish. Interior/exterior use.